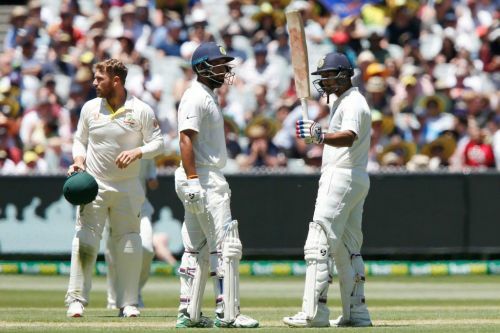 After losing to Australia by 146 runs at Perth, India lost the early lead that they gained by winning the Adelaide Test. One of the reasons for India's loss at Perth was the team selection. On a pitch which aided Nathan Lyon, India did not field a specialist spinner. In addition to that, the Indian openers - Murali Vijay and KL Rahul - did not show any improvement and have failed the rest of the team in both the Tests. Before the start of the 3rd Test, India rectified these mistakes by announcing the playing XI with three changes on Christmas Day. Substituting Vijay and Rahul, India chose Mayank Agarwal to make his debut as an opener and Rohit Sharma was roped into the side too. On the other hand, a 'fit' Ravindra Jadeja replaced Umesh Yadav, who wasn't effective on a lively Perth pitch. Accompanying Mayank Agarwal at the top was Hanuma Vihari who showed solid technique at Perth. The opening partnership between Agarwal and Vihari was worth 40 and lasted for 18.5 overs. Vihari fought it out in the middle during his 66-ball innings but was bounced out by Pat Cummins. The wicket of his opening partner did not deter the debutant, Mayank Agarwal. He continued to score confidently and became the second Indian batsman to score a half-century on debut. He stitched an 83-run partnership for the second wicket with Cheteshwara Pujara before getting out for 76. The debutant's wicket meant that Virat Kohli joined Pujara in the middle. Like Mayank, Pujara too went onto to score a half-century and steadied the Indian innings after the second wicket. Before the end of day's play, Kohli and Pujara added 92 runs for the third wicket and will look to add many more on Day 2. At stumps, Pujara and Kohli were batting at 68* and 47* respectively. Was hard work but India can be satisfied they won the day. Have to admire Shastri's surprise selection policy. Giving Australia no beards or tattoos to target has completely flummoxed them. Are also no 1 in the Indian batting lineup now. Fine debut for Mayank Agarwal. May not have been a hundred but he played like he belonged. Like Shikhar Dhawan, Mayank Agarwal made his Test debut against Australia at the mature age of 27, with much experience at the first class level. Mayank’s first Test innings may not have the dash of Dhawan’s, but it has been equally impressive, given the state of the series. Trial by fire and debutant Mayank Agarwal passes it with flying colours with a fine half century. Bravo! Vijay and KL would have loved to bat on this wicket . Live scenes from the MCG show Pujara trying to get in to bat. He is being told that the first wicket hasn't fallen yet. Love how majority of Australians are fooling themselves into believing that it was only warner and nobody else, bit like Indians fooled themselves by believing that banned IPL teams' owners were only "bettting" and no other players apart from those who were caught were involved.